It's the Merriest time of the year! Why not head down to Knotts for some good old western fun? 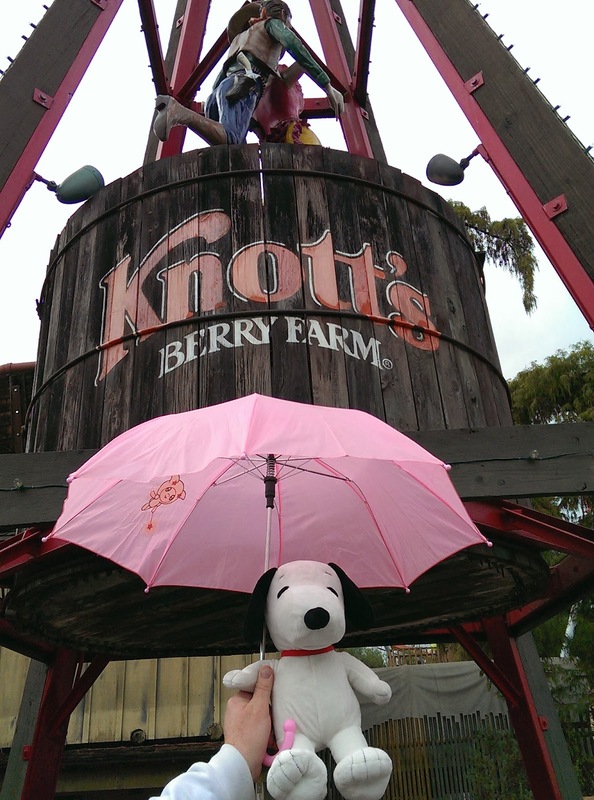 As the oldest theme park in California, Knotts Berry Farm has a long history of tradition. 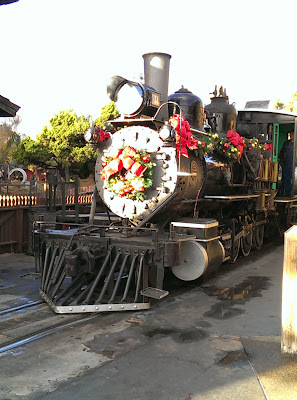 My newest holiday tradition was to head down for their Knotts Merry Farm! We love the Western feel of Knotts! 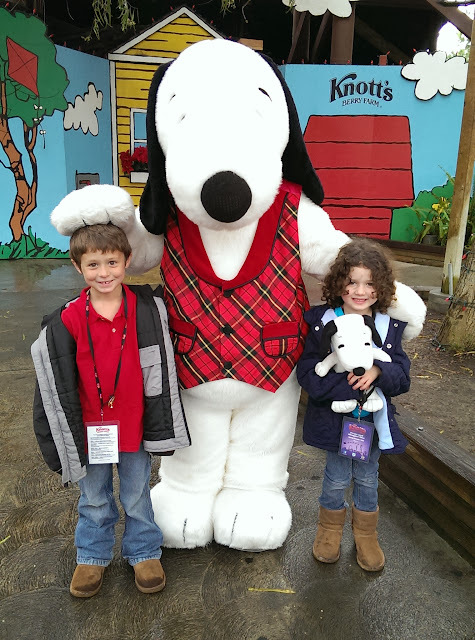 The old fashioned trains, food, activities and of course Snoopy! My family was sent a plush Snoopy to enjoy and get ready to prepare for the holidays. We were given the task as part of a fun holiday game to take pictures with Snoopy as we went about our own holiday traditions. Not only are we big Snoopy fans in my house but my moms boss is the BIGGEST Snoopy fan ever! We are always on the lookout for him for the perfect birthday or Christmas gift. My goal if I wish to accept it is to find a Snoopy present for my Mom's boss that he doesn't already have. This proves VERY difficult every year. What to get him? If it is the wrong present, will she lose her job? Doubt it but for ones so dedicated to our favorite Beagle, I must do my best. 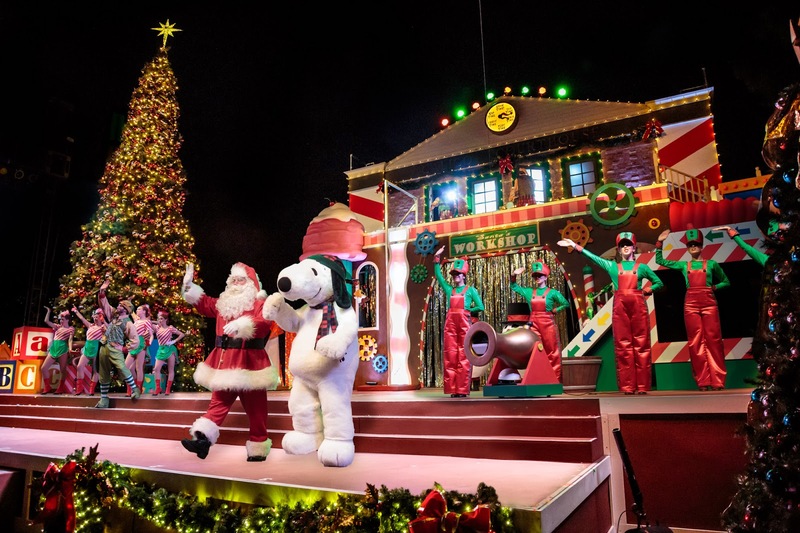 This month starts Knotts Merry Farm with exciting new shows, activities and magical memories! Knotts Merry Farm takes the Christmas season in stride as they decorate the park in twinkling lights, snowmen, carolers and the man of the month, Santa! 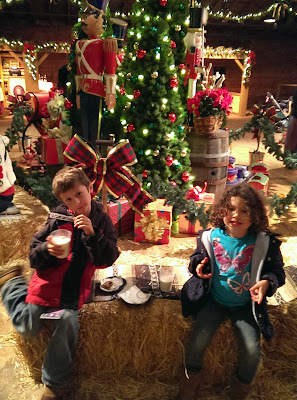 Try the holiday treats and hot chocolate while awaiting your turn to take a picture with Santa! 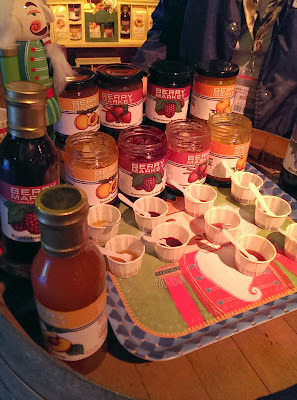 For those moms and dads, there was an extra special treat in the form of wine and beer tasting! 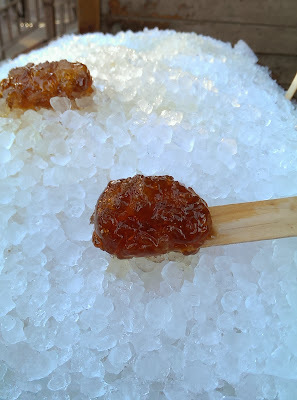 There were old time treats such as maple syrup pops that looked "simply devine". 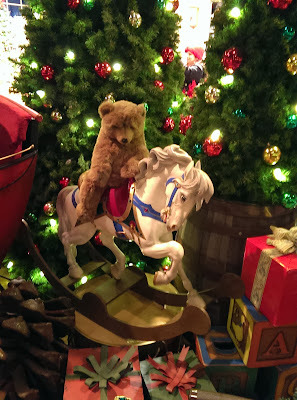 Many of the rides were decorated in spirit of Christmas and we loved watching Lucy's Christmas List in Camp Snoopy. My son even got chosen to go onto the stage. We hopped over to The Charles M. Shulz Theatre for the always spectacular, "It's Christmas Snoopy", the wonderful Snoopy on Ice Christmas show. The ice skaters were amazing! My daughter who was going to perform in her first skating show was enthralled! At the Birdcage theatre, there were live performances of the "Gift of the Magi" and "A Christmas Carol". Two of my favorites! 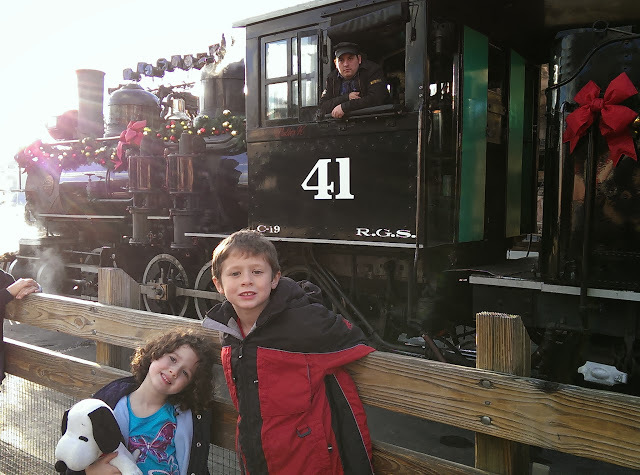 If you love the history of trains and the wild west as much as my family, be sure to check out "Christmas on Engine 41" near Calico Stage. 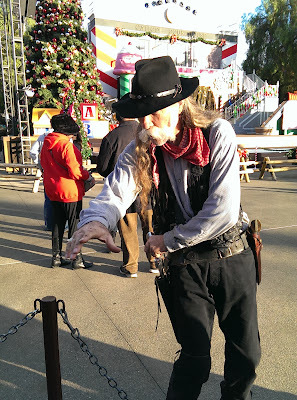 As you take a ride around the park, you interact with different wild west characters! The kids were fascinated with the conductor and the gentleman who was going to ask his sweetheart to marry him. We enjoyed an afternoon at the park and was excited for the special celebrity reading of the Christmas classic of "Twas the Night Before Christmas". China Parks(Ant Farm) and other Disney favorites blessed us that night along with a wonderful cast of elves and of course Snoopy as they held the "Merriest Tree Lighting". It looked so pretty! 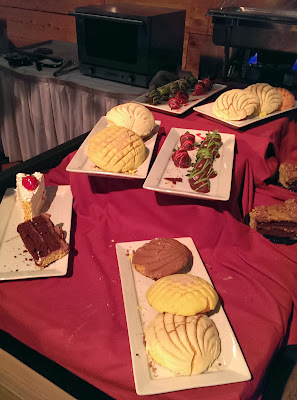 As it was getting late, we decided to check out the new Santa's Christmas Cabin where we were greeted not only by Santa but his elves that had goodies such as beer, wine, sundaes, hot chocolate, coffee and sweets to enjoy. The cabin was beautifully decorated and provided a lot of fun family memories before we headed home.